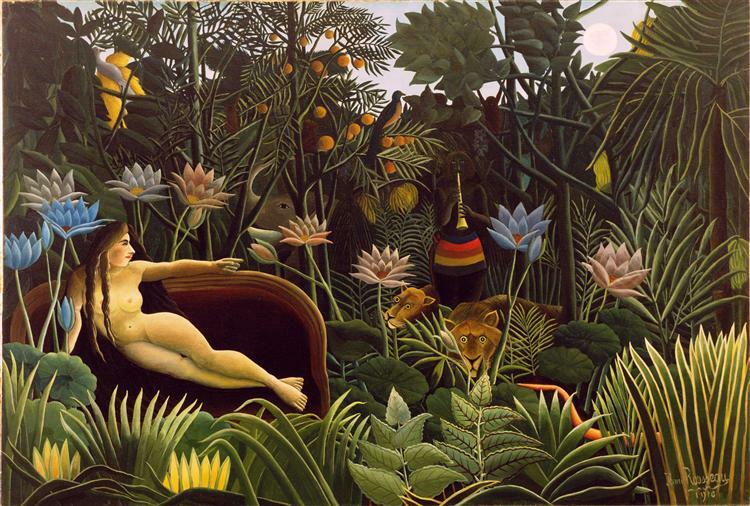 Because the jury at the Academie de peinture et de sculpture would not accept his work, Tiger in a Tropical Storm, Rouseau had to enter it under a different name, Surprise, at the Salon de Independants, which was open to all artists. 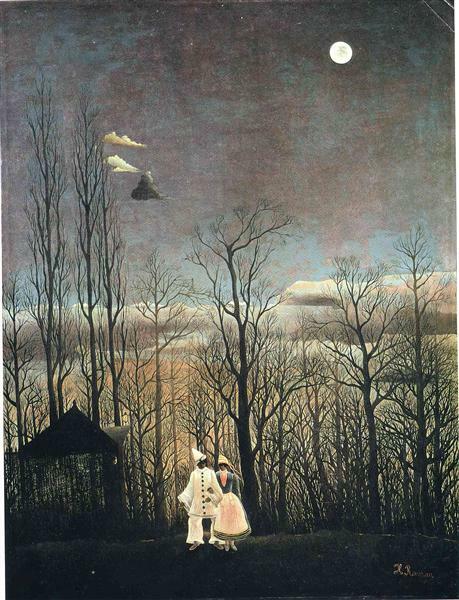 The painting was not a smash hit, as it received mixed reviews, ranging from ridicule at the childish naiveté of the painting, to the understanding and acclaim at its technical complexity, and with it he received his first recognition as an accomplished artist. 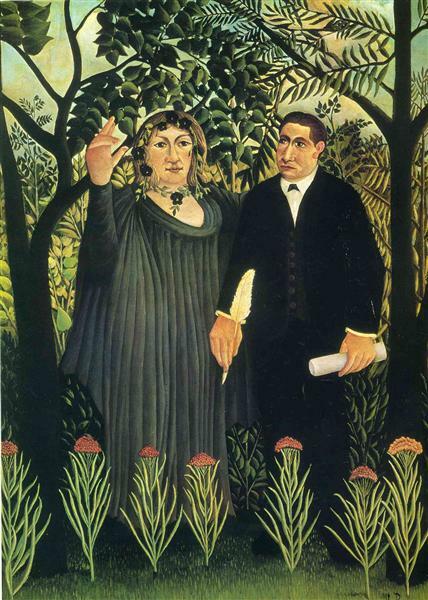 Although there are tales (which may have been spread by himself) that Rousseau had studied the flora and fauna of the jungle during his travels in Mexico, he never left France, and learned all he knew of the jungle from botanical gardens, textbooks, and oral accounts. He (Rousseaues tiger) is derived from a motif found in the drawings and paintings of Eugène Delacroix. 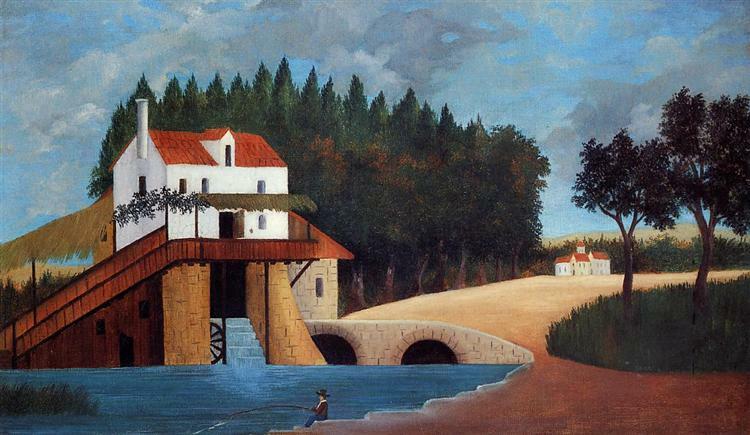 It was claimed, either by Rousseau himself or by his friends and admirers, that he had experienced life in the jungle during his time in Mexico in 1860, where he had served as a regimental bandsman. 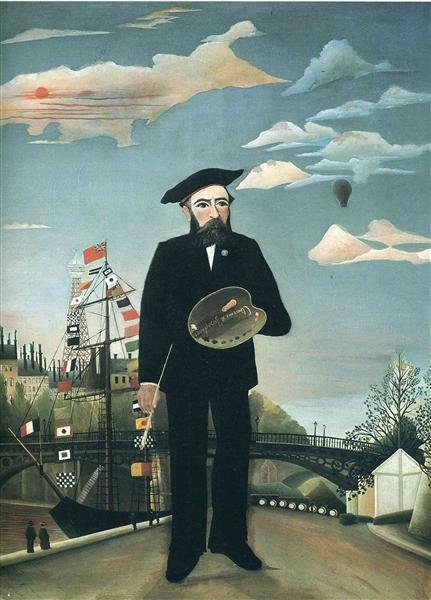 In fact he never left France, and it is thought that his inspiration came from the botanical gardens of Paris, such as the Jardin des Plantes (which included zoological galleries with taxidermy specimens of exotic animals), and from prints and books. 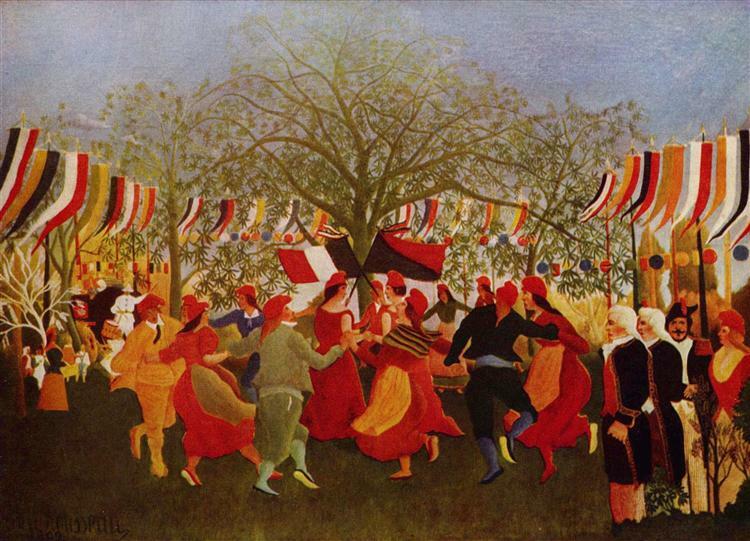 The fin de siècle French populace was captivated by exotic and dangerous subjects, such as the perceived savagery of animals and peoples of distant lands (Morris & Green, 49–60). Tigers on the prowl had been the subject of an exhibition at the 1885 École des Beaux-Arts. Emmanuel Frémiet's famous sculpture of 1887 depicting a gorilla carrying a woman exuded more savagery than anything in Rousseau's canvases, yet was found acceptable as art; Rosseau's poor immediate reception therefore seems the result of his style and not his subject matter (Morris & Green, 143). 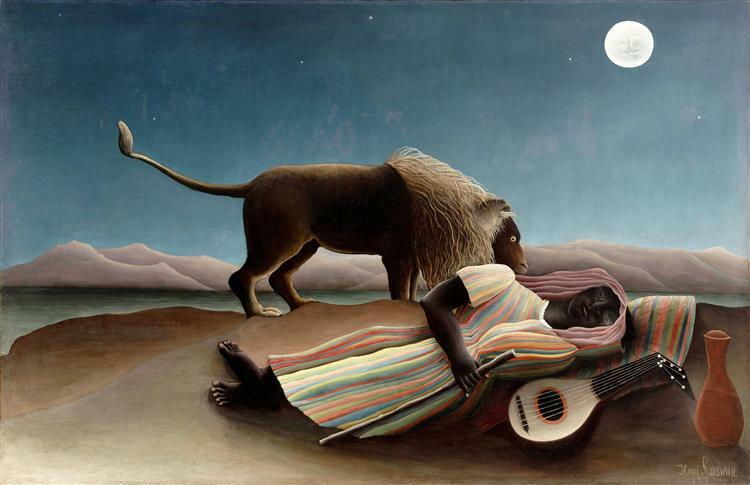 The tiger's prey is beyond the edge of the canvas, so it is left to the imagination of the viewer to decide what the outcome will be, although Rousseau's original title Surprised! suggests the tiger has the upper hand. 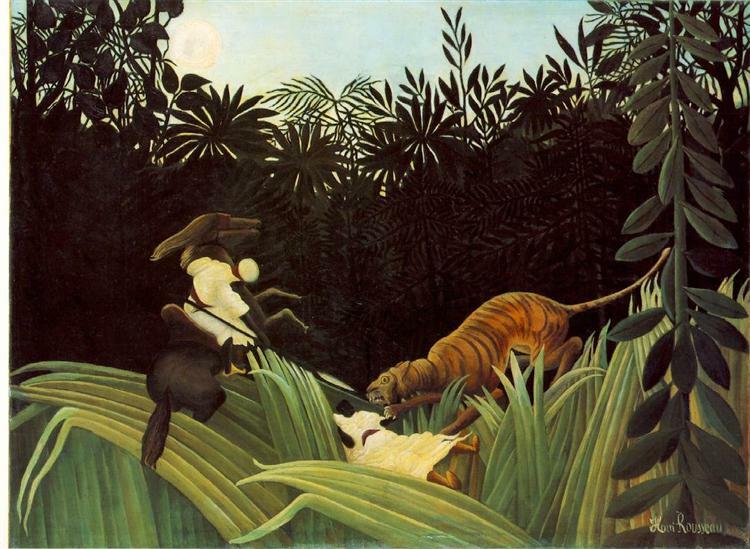 Rousseau later stated that the tiger was about to pounce on a group of explorers. 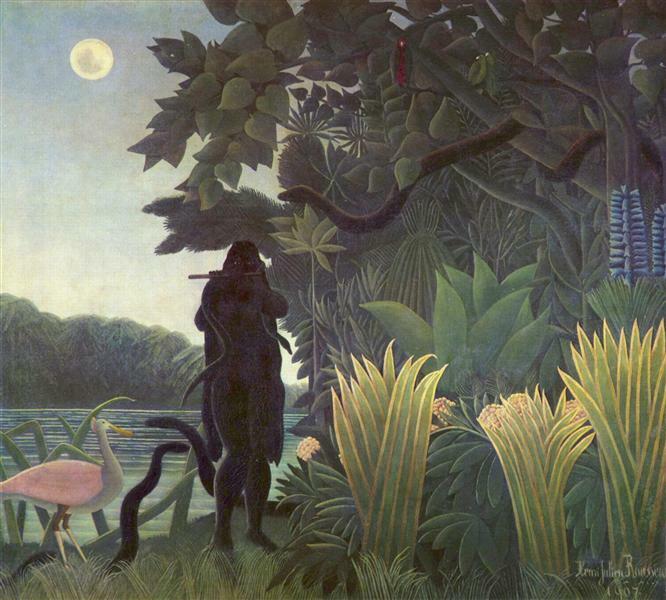 Despite their apparent simplicity, Rousseau's jungle paintings were built up meticulously in layers, using a large number of green shades to capture the lush exuberance of the jungle. He also devised his own method for depicting the lashing rain by trailing strands of silver paint diagonally across the canvas, a technique inspired by the satin-like finishes of the paintings of William-Adolphe Bouguereau. 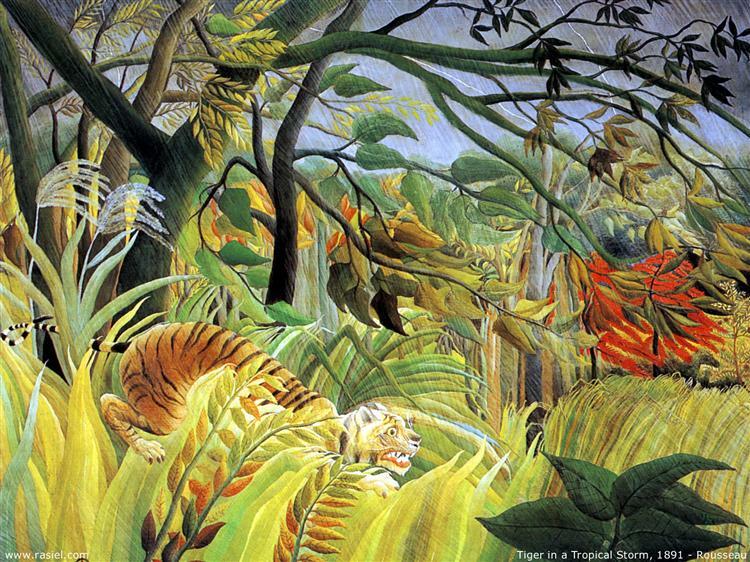 Although Tiger in a Tropical Storm brought him his first recognition, and he continued to exhibit his work annually at the Salon des Indépendants, Rousseau did not return to the jungle theme for another seven years, with the exhibition of Struggle for Life (now lost) at the 1898 Salon. 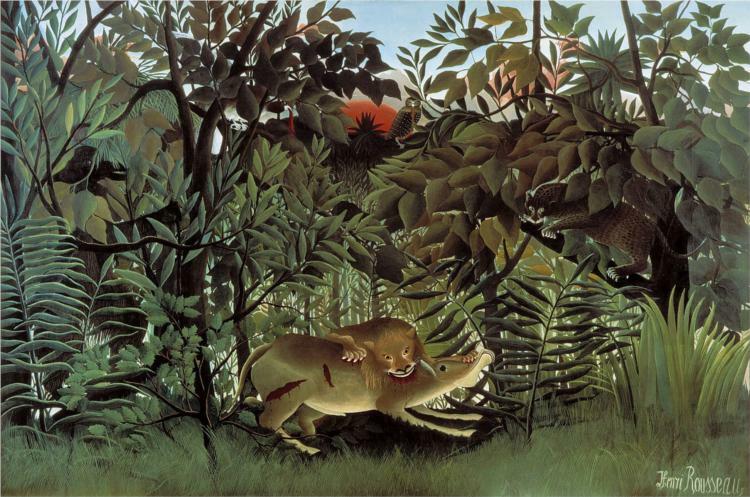 Responses to his work were little changed; following this exhibition, one critic wrote, "Rousseau continued to express his visions on canvas in implausible jungles... grown from the depths of a lake of absinthe, he shows us the bloody battles of animals escaped from the wooden-horse-maker" (Morris & Green, 142). Another five years passed before the next jungle scene, Scouts Attacked by a Tiger (1904). The tiger appears in at least three more of his paintings: Tiger Hunt (c. 1895), in which humans are the predators; Jungle with Buffalo Attacked by a Tiger (1908); and Fight Between a Tiger and a Buffalo (1908).